"Mom's recipe for success includes pouring white wine over the partially baked chicken. I've used sherry in a pinch!" 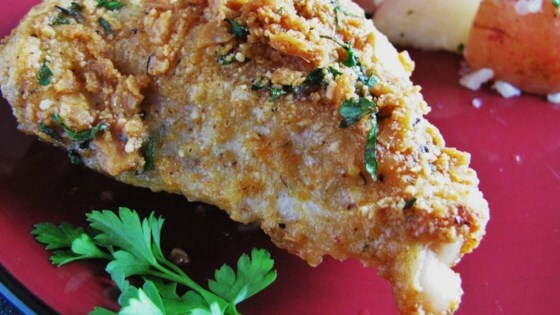 Baked Parmesan chicken with an easy, elegant white wine sauce. I made this with 4 chicken brests and had way too much bredding left over. However, the chicken was so tender and tasty it was a great change of pace! This chicken really knocked my socks off!!! I wish my mom made chicken like this. This is a great day for chicken.